K.R. Mangalam World School, G.K-II lays focus on inclusive education and holistic development of all the students irrespective of their academic caliber. ‘Together Towards Tomorrow’, our motto, symbolizes and encompasses our vision of an integrated enlightened world. In a developing, democratic country such as ours, K.R. Mangalam World School, G.K-II, plays a stellar role in moulding young adults, who would assume societal leadership roles in the future. 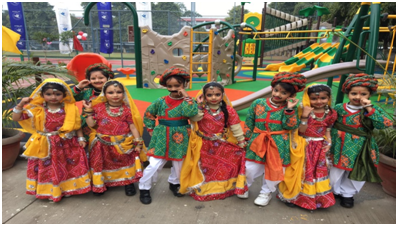 In pursuit of the same, the Pre Primary students of K.R Mangalam World School, G.K-II participated in various competitions held at Apeejay School, Sheikh Sarai on Friday, 27 January 2017 and came out with flying colours bagging the First Position. The Principal, Ms Alka Awasthi congratulated the students and motivated them to forge ahead with success.